Comments: Deciduous broadleaf native to southeastern US and Mexico. 5 to 7 lobed palmate yellow-green leaves with deep indentations and fine serrated. Seed pod is 1.5" diameter with sharp spikes. 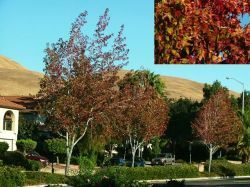 Specimen tree is 15' tall with typical pyramidal shape. Good Fall colors of yellow and red. 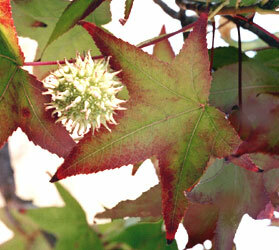 Also called sweetgum.